Wat Pha Sorn Kaew is a Buddhist monastery and temple near the town of Khao Kor, North in north-central Thailand. The monastery was built on a 830 m peak in 2004. The name means “Temple on a glass cliff”. 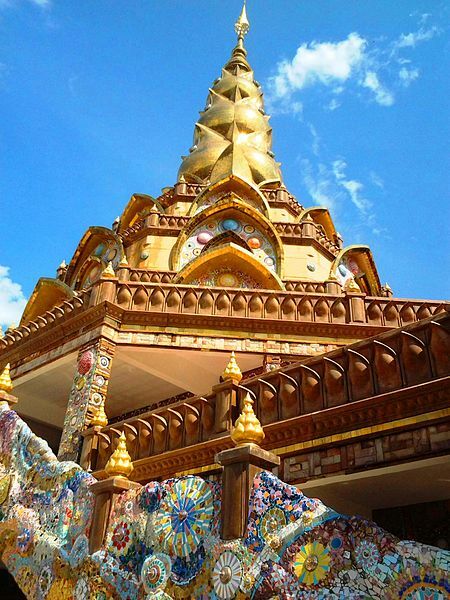 The main pagoda and surrounding buildings are adorned with over 5 million colorful mosaic tiles and pottery items. Astrogeographic position for morphogenetic field level 4 which describes the atmosphere, energetical topics and function of the monastery itself: the site is located in the highly idealistic constellation of the two air signs Aquarius and Libra. Creative, innovative, fixed, spiritual Aquarius sign stands for the sky, heaven, paradise, abstraction, flying, the air above the highest mountain tops, leaving polarity behind, reconnection with the fuller amount of ressources, self-finding, inspiration, inventions, radical solutions and revolution. Aquarius stands for the high position on top of a hill and overlooking the landscape. And Aquarius is a typical stimulator for inventing and trying out new technologies and ideas. The use of glass – a highly fragile, cheap, artificial material with a shiny surface is to be related to the position in Aquarius here. The second coordinate of the monastery lies in aristocratic, service-orientated air sign Libra the sign of beauty, decoration, balance, harmony, symmetry, angels, naive painting and the reflex to strife for the ideal of a higher culture and beautify the surroundings. The beauty of the colourful decoration is a clear resonance of the position in Libra. Aquarius` abstract view and tendency for self-liberation can have the effect of setting Libra`s urge for decoration free from judgements and hinderances.